Voting Closed: 2014 Reader’s Choice Awards! It’s that time of year again! My Reader’s Choice Awards are hands down one of my favorite posts to do on Emily Bites. I get nervous no one will respond (every year without fail, even though people vote every year, haha) and then I get so excited whenever votes come in and I generally drop whatever I’m doing to see what you voted for. It’s seriously like Christmas to me every time I get new votes in, so THANK YOU to everyone who has voted in the past and everyone who will (hopefully) vote again this year! Not only are you making my day, but you’re helping new Emily Bites readers find my most popular recipes. I always say this, but I can’t believe it has been almost 4 years since I started this site. It feels like it has always been a part of my life, but four years ago I was still just reading other cooking blogs and wondering if I should start one. It’s such a wonderful surprise and a blessing that what was once just a thought turned into a hobby and a passion and a job and that all of you have come here to read and follow my site, cook alongside me and share the recipes with friends. Thank you for that, it means the world to me. Your comments and messages inspire and motivate me every day and I really, really appreciate you for being here. Without further ado (I can gush on forever), it’s time to ask you, my wonderful readers, to choose your favorite recipes from the past year. I’m so excited to see what you pick! 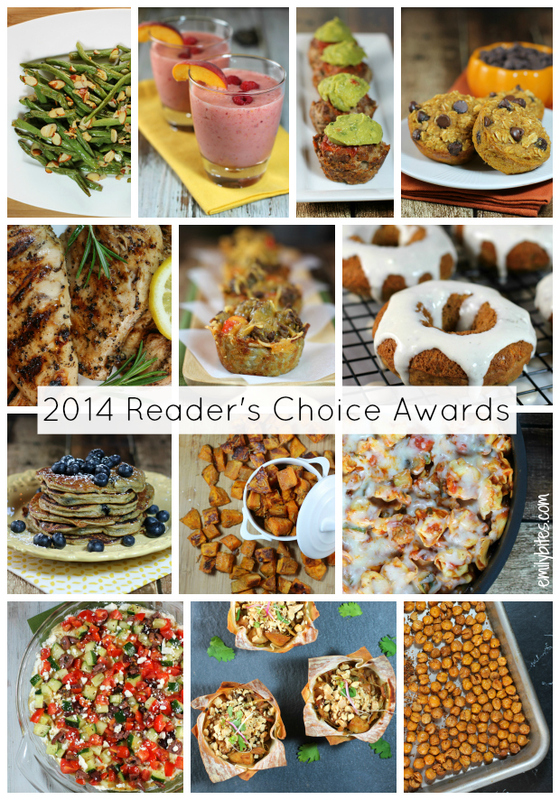 If you need some inspiration and want to see the winning recipes you chose in past years, check out the Readers Choice Award Winners from 2013, 2012 and 2011! Thank you so much in advance for voting! Y’all know I get nervous, so if you’re thinking about it, please do! VOTING CLOSED: Best of 2018 Reader’s Choice Awards! I have picky eaters, so haven’t tried everything on here, but I had some friends over on Friday and everything I made was from you! Thank you!! I was so excited to see it’s time for this! I LOVE seeing the winners each year, and I love having my vote counted! 🙂 Thanks, Emily! I need to make some more of these! You inspire me! I seriously feel like the girl you are talking about above as you make me want to do the same thing . I love all of the recipes of yours that I have tried and you make following Weight Watchers so much better than it already was! This diet has seriously changed my life and I am BEYOND thrilled that I found your site. I honestly do not know where I would be without the recipes that you have created. Not a week goes by that your recipes are not served at some point during my week and my ENTIRE family enjoys them! Thank you again and Happy Holidays to you and your family!! 6. B – SERIOUSLY CHANGED MY LIFE! The Doritos taco salad is awesome, we have it at least once every ten days. The chicken cordon blue pasta bake is the best recipe of the year! 6. B & E – Both are SO GOOD. 9b seriously, the yummiest thing ever!!!! 7. C – SO HARD – ALL were awesome! 11. A – SO SO yummy! I so glad I tried it. Thanks Emily, hard to vote, all were so good! Wonderful blog, I love the recipes! Thanks for all the amazing healthy recipes you post! Your blog is a staple in my dinner planning. 11.C. I made these when my in-laws came to visit and it was a huge hit!